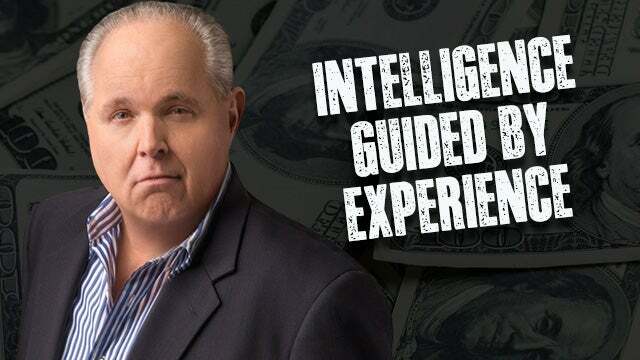 RUSH: On the economic front, ADP, the private payroll group, has told everybody to get ready for a massively great unemployment/employment story, because private payrolls that they track and follow grew by 234,000 in January. ADP was expecting 185,000. This is private sector job… Not creation. It’s their tally. “The New Year got off to a strong start for job creation, businesses adding 234,000 jobs in January, according to ADP and Moody.” They were expecting 185,000 new jobs. Now, sometimes these numbers don’t jibe with government numbers, but Moody’s is nevertheless saying to people, “You’d better look out because with everything else happening in the economy, the job market is poised to explode right along with the rest of the economy. In addition, in all of 2017, wages rose 2.6%. U.S. oil production has hit an historic milestone. Ten million barrels per day are being produced in the United States, and you know why? Because we got rid of the policies associated with the Obama administration and energy. The Obama administration believed the United States was causing global warming, that we were destroying the planet. The Obama administration was trying to stop fracking. They were trying to stop mining and usage of clean coal. In less than six months, Trump came along and swept all that away. Now we’ve had rebounds in oil plus the pipelines to deliver it and clean coal, and now we are an exporter of energy. It’s stunning, this turnaround! An exporter of energy! When for most of our lifetimes, we have grown up hearing how we’ve become too dependent on foreign oil. Remember all those times we’ve heard that? And it usually meant Saudi Arabia. Now we’re exporting. And then this. Just saw this on CNBC. “The Atlanta Federal Reserve is forecasting first quarter GDP at 5.4%.” The Atlanta bank of the Federal Reserve system is forecasting GDP growth of 5.4% in the first quarter. Folks, if we get anywhere close to that, you’re gonna see so many Democrats come out in opposition to a great economy. It’s gonna be so exciting to see if we get anywhere close to that.